Renewable energy use broke a big record in Europe last weekend. It’s a pretty big deal when a small country like Sri Lanka, Iceland, or Tokelau generates all the power it needs from renewables. When Europe’s #1 economy—Germany, with the fourth largest gross domestic product in the world ($3.7 trillion, exceeded only by the US, China, and Japan)—gets to the point of covering 90% of its power with renewables (55 gigawatts of the 58-GW total), people stand up and take special notice. Renewable energy has made up the largest sector of Germany’s electricity supply since 2014 (nearly 26% at that time). On Sunday, May 8, 2016, at 11 am local time, total output from German solar, wind, hydropower, and biomass reached this milestone, according to Agora Energiewende, a Berlin-based clean energy think tank. The 2016 number beats last year’s record reading (around 75%) by German renewables. This year’s high actually sent power prices into the negative for several hours. 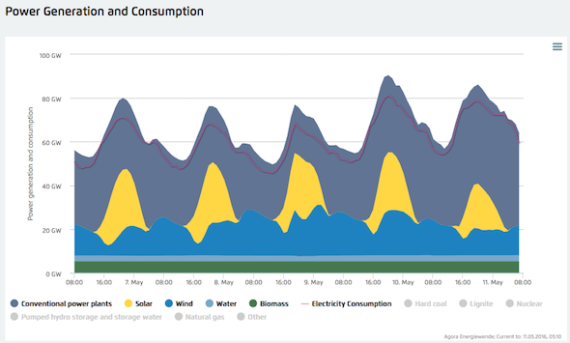 Reduced power demand and ample solar and wind energy accounted for the huge renewable contribution. The Sunday numbers show that wind, solar, and other renewable sources can match the demands of a highly industrialized society, at least on an occasional basis. In fact, as Germany’s economy has grown in recent decades, clean energy use has increased proportionately. While Germany still gets most of its power from coal, oil, and gas, on average, renewables supply almost a third (30%) of the country’s power. The US, a country four times more populous, lags far behind, with only about 13% of its power coming from renewables. In solar, Germany is ahead of the United States despite its smaller size and dimmer solar resources, which compare to Alaska’s.